I am not a breakfast person. I am not a morning person. I am not a cook-in-the-morning person. But, when you (and most of the people you know) have small kids, mid-morning is the most packed part of your social calendar; thus, solutions must be found. 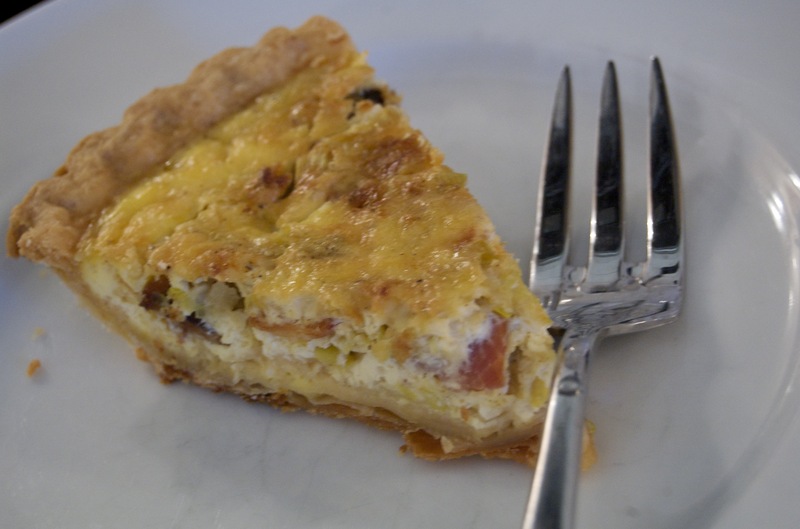 My favorite solution, of late, is this quiche. Chock-full of smoky bacon, mildly sweet with melted leeks, and with the creamy funk that only a good Gruyère can give, this pie is based on what is said to have been one of Julia Child’s favorite lunches. I like to make this the day or evening before we are expecting morning guests, and then heat it in a 275-degree oven for about a half an hour before serving it. Note that the source recipe, which can be found at Food & Wine, is for two 10-inch tarts and requires you make your own tart crust. While I enjoy making my own crusts and do have a pretty fool-proof recipe, I also keep some good-quality pre-made crusts in my freezer for when the presence of a finished product is more important than the boast that the entire thing was made from scratch. Heat oven to 375 degrees F. Line the pie shell with foil and fill with pie weights or dried beans. Bake the shell for 30 minutes, just until dry. Remove the foil and pie weights and bake the crust for about 15 minutes longer, until golden. Transfer to a baking sheet. Meanwhile, cook the bacon in a large skillet over moderately high heat, stirring, until browned and crisp. Drain the bacon, leaving 2 teaspoons of the fat in the pan. Add the leeks and thyme to the skillet, season with salt and pepper and cook over moderate heat, stirring occasionally, until the leeks are softened but not browned, about 5 minutes. Transfer to a bowl and let cool. 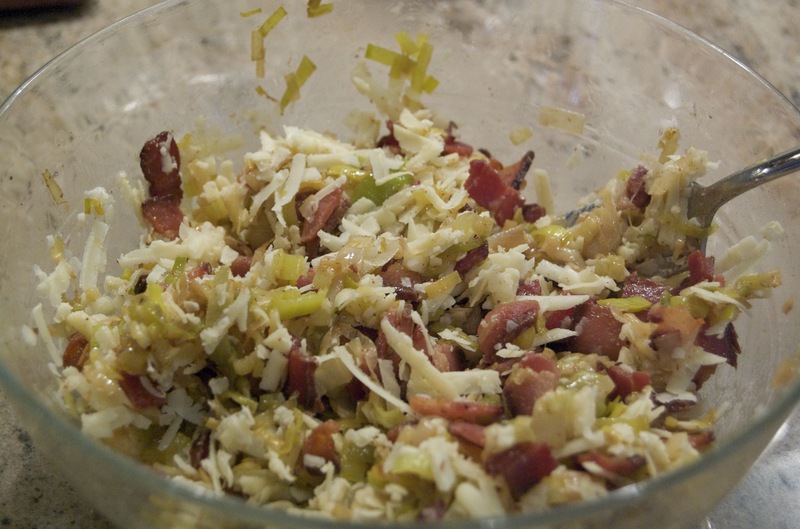 Stir in the bacon and cheese. Transfer filling to the pie shell (you may not use it all, depending on your crust). In a bowl, whisk the eggs with the egg yolk and heavy cream. Season lightly with salt and pepper. Pour the custard into the tart shells, as full as you can without it overflowing the crust. Bake for about 30 minutes, rotating the sheet halfway through, until puffed and lightly browned. Transfer the quiche to a rack and let cool for 15 minutes. Cut into wedges and serve. so pretttttty!!!!!! love it… why didn’t you do this sooner?? ?